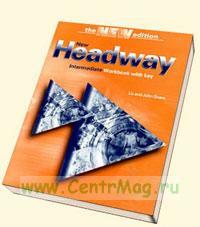 New Headway Intermediate. The world's most trusted English course.New Headways the course teachers and learners can rely on. Why? An authoritative integrated syllabus, motivating topics, and clearly focused tasks, combine with a real understanding of what works in the classroom. It all makes for effective teaching and effective learning. Workbook cassette/CD for extra listening practice.Free-standing pronunciation course with cassette/CD.Online resources: interactive exercises for students available online at. 2 Full verb or auxiliary verb? 4 My computer's gone wrong! 7 Present Simple or Present Continuous? 3 Past Simple or Past Continuous? 5 What was he doing? What did he do? 13 was, were, did, or had? 1 What do they have to do? 6 must or have to?. 7 mustn't or don't have to?. 1 will or going to? 2 Where are they going? 2 like or would like? 6 Infinitive or -ing form? 1 How many did she...? How many has she...? 6 First or second conditional? 2 Why is he late? 1 Present Perfect Simple or Continuous? 3 Do you know where...? 8 What do you say?